Last year, the UK government was presented with a preliminary report about an inquiry into British security services' alleged role in the extraordinary rendition and torture of terror suspects. The government said at the time that it would make the report public — but it has never surfaced. The report was produced as part of the so-called 'Detainee Inquiry', set up by prime minister David Cameron in 2010 to investigate allegations of British security agencies' involvement in the mistreatment of individuals accused of terror offences. Spy agency MI6, for instance, has been blamed for helping to facilitate the abduction and subsequent alleged torture of a Libyan Islamist and his pregnant wife, who were covertly 'rendered' from Bangkok and reportedly taken to a Libyan prison run by the Gaddafi regime in 2004. Headed by retired judge Sir Peter Gibson, the Detainee Inquiry was supposed to look into these allegations and others. It was scrapped in 2012 amid controversy because the government said that it clashed with ongoing police investigations into some of the same cases. But a preliminary report was produced by the inquiry and sent to the prime minister on 27 June 2012. At the time, the government issued a statement saying that the report focused on "preparatory work to date, highlighting particular themes or issues which might be the subject of further examination." Justice Secretary Ken Clarke said that the government was committed to publishing "as much of this interim report as possible." Almost 18 months on, however, where is the preliminary report? That is exactly what I have been trying to find out. And the UK government is not returning my emails. In September, I sent a Freedom of Information Act request seeking a copy of the report to the government's Cabinet Office. Under the FOIA, the government has 20 working days to issue a response. 31 working days have now passed and I have sent three separate emails related to the request. I have received nothing in response — not even an acknowledgement informing me that my request has been received. This means that the government is violating its legal obligations, according to an official I consulted at the Information Commissioner's Office, the public body that enforces access to information legislation in the UK. I submit quite a lot of FOI requests, and I can't think of another occasion when a government department has flat-out ignored a request in this way. It is very unusual. Normally, the procedure is that you will receive an acknowledgement within a few days. And a couple of weeks later the respective department will either send you the information or refuse to release it, usually citing some flimsy national security secrecy exemption. Notably, the chap who runs the website Spy Blog has also previously attempted to obtain a copy of the preliminary report. His efforts have so far been stonewalled. But unlike me, Spy Blog has at least been privileged enough to receive responses from the Cabinet Office, most recently in July. The Cabinet refused to disclose the report to the website, claiming that officials were busy "clearing the report for publication" and adding that they expected that it could be published "in the autumn, although no date has been set." These qualifications recognise that sometimes there will be an overriding public interest in the information being released prior to the intended publication date. Public authorities should not be able to avoid putting information in the public domain by adopting unreasonable publication timetables or an 'intention' to publish where there is little prospect of that happening within a reasonable timescale. Given the seriousness of the allegations about UK security agencies' role in facilitating extraordinary rendition and torture, there is evidently a very strong public interest case for this preliminary report to be immediately released under the Freedom of Information Act. That is especially true given the inexplicably lengthy delay that we have already had to endure. It's worth also pointing out that despite the sort of behaviour detailed above, the government continues to audaciously insist it is committed to transparency. Just last week the Cabinet Office was proclaiming "wide-ranging new commitments to bring more of the benefits of transparency into people’s everyday lives." Cabinet minister Francis Maude was quoted as saying that "transparency is an idea whose time has come." Unfortunately, the section of Maude's own department responsible for implementing transparency does not appear to have received the memo — and is currently flouting the Freedom of Information Act in a case involving the withholding of important information that the public clearly has a right to know. I have lodged a formal complaint about the Cabinet Office's conduct with the Information Commissioner's Office — so watch this space. UPDATE, 4 December 2013: Late last month, the Information Commissioner's Office replied to the complaint I filed about the UK government's non-response to my request that it release the rendition/torture report. An official from the ICO said he had contacted the government's Cabinet Office to confirm that my request had been received and to give the government a 10-day deadline to contact me. The ICO reminded the government of its obligations under the Freedom of Information Act and noted that it "may consider taking enforcement action" should similar complaints arise (read the ICO's correspondence here). However, despite this light reprimand from the ICO, incredibly I've still received no response from the government about the rendition report. The 10-day deadline expired yesterday and I've heard nothing — I've not yet so much as received an acknowlegement that my initial request is being dealt with, even though it was submitted more than two months ago (the government is supposed to respond within 20 working days; it's now been more than 50). This means that the Cabinet Office, which likes to tout its transparency credentials, is not only actively flouting its obligations under the Freedom of Information Act — it has also now failed to act on a formal request made by the authority that enforces the FOIA law, the ICO. Before the end of the week, I'll be following up my complaint with the ICO in the hope that more serious action can be taken. Of course, I'll post further updates here with any new developments in this strange case as and when they arise. UPDATE, 29 December 2013: The government has released the Detainee Report today; the Guardian reports that it reveals how "MI6 officers were under no obligation to report breaches of the Geneva conventions and turned a 'blind eye' to the torture of detainees in foreign jails, according to the report into Britain's involvement in the rendition of terror suspects." I am still pursuing my complaint against the Cabinet Office for its handling of my FOIA request. UPDATE, 26 March 2014: In response to my complaint, the Information Commissioner's Office issued a "decision notice" stating that the Cabinet Office breached section 10 of the Freedom of Information Act in ignoring my request. More details here. On 30 October 2006, an Islamic school in Pakistan was targeted in a missile strike that killed up to 81 people, most of whom were reportedly children, some as young as seven. At the time of the strike, which took place in the town of Chenagai in the tribal area of Bajaur, Pakistan's military claimed responsibility, saying it had targeted the school — known as a madrassa — because it was being used as a terrorist training facility. However, an anonymous former Pakistan official, described as an ex-"key aide" to then-President Pervez Musharraf, later reportedly claimed that the attack had been carried out by a US drone, according to the Sunday Times. The US denied any role, saying it was "completely done by the Pakistani military." Now, a newly published report has raised fresh questions about exactly who was behind this horrific incident. A leaked Pakistan government document, published by London's Bureau of Investigative Journalism on Monday, lists the Bajaur case among a series of US Predator drone strikes and NATO-backed attacks in Pakistan between 2006 and 2009. The Bureau says that the document shows the attack was the result of "a single drone strike," though the document does not specify whether a drone or other aircraft was involved. So who carried out this controversial attack? At the time of the strike, Pakistan's army spokesman said that it had been carried out by Pakistan military helicopter gunships that fired four or five missiles into the madrassa. One local villager told the BBC he had "heard helicopters flying in and then heard bombs." An NBC news correspondent, who was reportedly about a mile away from the madrassa at the time of the incident, said that it "was dark and very early in the morning when the blast occurred. And then I heard helicopters over the village of Chenagai where the madrassa school is located." Analysts speculated that Pakistan's military may have not had the skills required to conduct the helicopter strike, because it was apparently conducted at 5am while it was still dark and had the hallmarks of an elite operation. Hours after the attack, Bill Roggio at the Long War Journal suggested that a US special operations team may have been behind it. "Look for signs of Task Force 145 having carried out this raid," Roggio wrote, "with unmanned Predators firing Hellfire missiles, and possibly C-130 and helicopters following up." Recently, Islamabad agreed with NATO that it could conduct operations in Pakistan from across the border in Afghanistan... Significantly, Pakistan and Taliban authorities struck a peace deal in Bajour only two days ago and were scheduled to sign a document to that effect on Monday. This lends credence to the possibility that it was NATO and not Pakistani forces that made the raid. Among those who died in the attack was the leader of the madrassa, a reportedly pro-Taliban radical cleric named Maulana Liaqat. Pakistan officials also claimed that Ayman al-Zawahiri — who was then Osama bin Laden's deputy — had used the madrassa to train suicide bombers. That would certainly have given both US and NATO forces a motive to want to target the building. And Pakistan has covered up for US drone strikes in the past. But still, there is still no concrete information that has been presented confirming beyond doubt that a US drone or any other US or NATO military aircraft was involved. Indeed, secret US diplomatic cables published by WikiLeaks in 2010, four years after the strike, did not hint at any US or NATO role. US officials writing in classified cables dated from 2006 described the incident alternately as a "Pakistan military strike against a madrassa/militant training camp" and a "Pak-Mil attack on an extremist madrassa." Even with the Bureau of Investigative Journalism's publication of the leaked Pakistani document attributing the attack to NATO forces or a US drone, in my view, the facts remain murky and contentious. And that is perhaps one of the most shocking elements of this story — that seven years on there is still such a lack of clarity about the circumstances of this grave incident, involving the reported deaths of dozens of innocent children. Without an answer to such a simple question — who pulled the trigger? — there can be no accountability, no closure, no recourse for justice for the families of those who lost a child on that day in Chenagai. It is an incident that seems to symbolise the bloody, faceless brutality of the ruthless covert warfare that has become a staple feature of the so-called War on Terror over the past decade, especially in the tribal regions of Pakistan. But just because there may be dangerous, high-level terror targets operating in these places, military forces, wherever they are from, should not get a pass to kill and maim with impunity. For that reason alone, the madrassa strike surely requires serious further scrutiny — perhaps from UN special rapporteur Ben Emmerson, who is currently investigating the issue of civilian drone deaths. Earlier this week, the UK's official communications interception commissioner published his annual report. The commissioner releases statistics every year that offer an insight into the levels of surveillance being conducted by UK authorities, including police, security and intelligence agencies. The latest report provides more evidence that the trend in recent years has been towards a general increase in surveillance of communications. 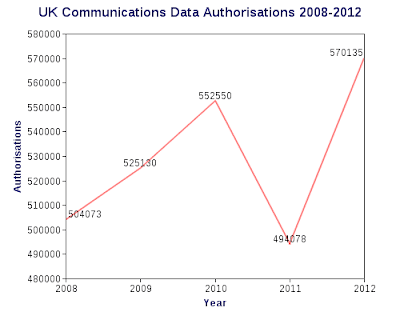 In 2012, the report shows, there were a record 570,135 authorisations for police and other agencies to obtain so-called "communications data." This can include subscriber information about suspects' phone and email accounts, as well as call and email records showing who a suspect is phoning/emailing and when. It does not include the actual content of the communication. 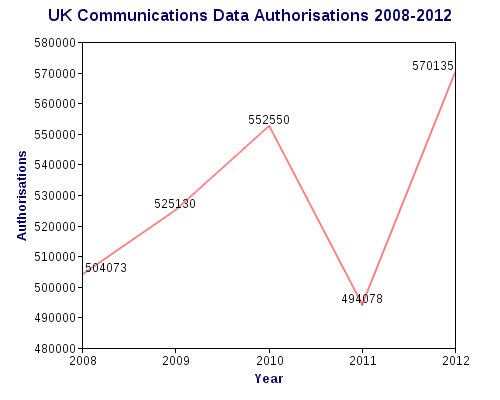 Notably, the 570,135 figure is a 15 percent increase on the figure for 2011 and amounts to about an average 1,562 communications data authorisations every day. In addition, the commissioner noted in his report that "979 communications data errors" were made by authorities in cases involving the wrongful collection of data from innocent individuals. The botched surveillance had serious ramifications, with six members of the public "wrongly detained / accused of crimes" as a consequence. The same trend is reflected in the latest statistics on the interception of communications. Interception is when the authorities obtain a warrant, signed off by the secretary of state, enabling them to secretly eavesdrop on phone calls or read emails and texts. 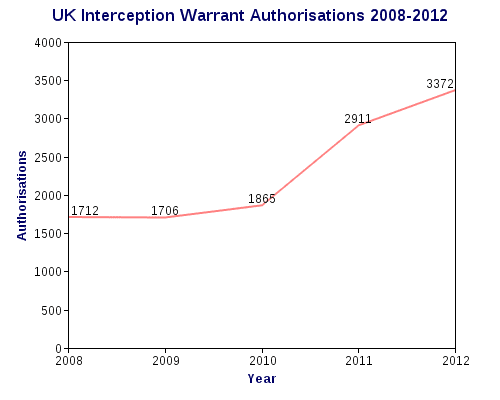 There were 3,372 interception warrants authorised in 2012, which represents a 16 percent increase on the figure for 2011. It is crucial to note that a single interception warrant can encompass large groups of individuals. It is not known exactly how many people were swept up in the 3,372 warrants because these figures are, unfortunately, not published. 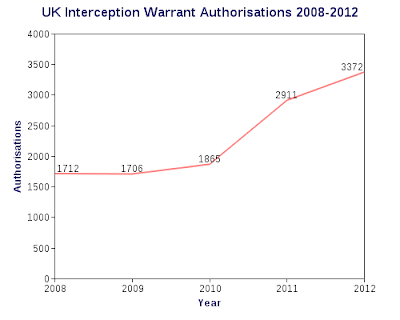 While surveillance is on the rise, as the above graphs show, the UK government has been arguing that it does not have enough digital spying capabilities and needs more surveillance powers. The government's case may have recently been damaged, however, by leaked secret documents, published by the Guardian in June, that revealed how UK spy agency GCHQ was tapping into internet cables and reportedly monitoring some 600 million "telephone events" every day. The exposed extent of GCHQ's spying offered a rare and startling insight into the sweeping scope of surveillance already being conducted by the UK government, and seemed to affirm what the UN's special rapporteur on free expression, Frank La Rue, warned about in an unprecedented report published just weeks before the leaks. "Technological advancements," La Rue wrote, "mean that the state’s effectiveness in conducting surveillance is no longer limited by scale or duration." Following disclosures by the Guardian earlier this month about a US National Security Agency internet surveillance program called Prism, it has emerged that UK government officials issued a so-called "D notice" in a bid to censor coverage of spy tactics. The D notice following the NSA leaks was reportedly issued to news organisations including the BBC on 7 June, the day after the Prism story broke. Prism is a system used by the NSA to monitor emails, file transfers, photos, videos, chats, and other data. Intelligence gleaned from the system has been passed to GCHQ, the UK's version of the NSA. There have been a number of articles recently in connection with some of the ways in which the UK Intelligence Services obtain information from foreign sources. Although none of these recent articles has contravened any of the guidelines contained within the Defence Advisory Notice System, the intelligence services are concerned that further developments of this same theme may begin to jeopardize both national security and possibly UK personnel. specific covert operations, sources and methods of the security services, SIS and GCHQ, Defence Intelligence Units, Special Forces and those involved with them, the application of those methods, including the interception of communications and their targets; the same applies to those engaged on counter-terrorist operations. The D-notice system was first set up in 1912 and operates in accordance with a voluntary code — providing "advice and guidance to the media about defence and counter-terrorist information the publication of which would be damaging to national security." In 2010, for instance, a D notice was reportedly issued prior to WikiLeaks' release of thousands of US government diplomatic cables. A D notice has no formal legal authority, but defying it can make journalists vulnerable to prosecution under the UK's Official Secrets Act. General Keith Alexander, the chief of the US National Security Agency, today appeared before a Senate committee and was quizzed publicly for the first time on issues related to the agency's recently revealed surveillance programs. Most of the questions Alexander faced concerned the secret mass retention of Americans' phone records, exposed by the Guardian last week, which the spy chief said is necessary to conduct retrospective surveillance of patterns of communication during counter-terrorism investigations — enabling the agency to go "back and time" to monitor who has called whom, when, and for how long. Perhaps the most notable point in Alexander's appearance came during an exchange with Oregon Senator Jeff Merkley (Democrat), who asked a few specific, probing questions about the section of the Patriot Act (215) being used to justify storing the records. Merkley seemed to believe the NSA had exceeded its authority in mass retaining the records, and I think his comments pinpoint a crucial part of the legal debate about the scope of the surveillance that we will see more of in the weeks ahead. Merkley also pressed for secret interpretations of the law being used by the government to justify the surveillance to be declassified and published, a point that Alexander seemed to agree was necessary though said he couldn't guarantee it because he was "not the only decision maker in the administration." Sen. Merkley: You referred to section 215 [of the Patriot Act] and 215 requires for an application for production of any tangible thing. It says in it that this application must have a statement of facts showing reasonable grounds that the tangible things sought are relevant to an authorised investigation. So we have several standards of law embedded in this application: A statement of facts, reasonable grounds, and tangible things that are relevant to an authorised investigation. Now as it's been described in this conversation and in the press, the standard for collecting phone records on Americans is now all phone records, all the time, all across America. How do we get from the reasonable grounds, relevant authorised investigation, statement of facts, to all phone records, all the time, all locations? How do you make that transition and how has the standard of the law been met? Sen. Merkley: Let me stop you there, because these are requirements to acquire the data, not to analyze the data, to acquire the data ... this is the application to acquire the data. So here I have my Verizon phone, my cell phone, what authorized investigation gave you the grounds for acquiring my cellphone data? General Alexander: On this part here, on the legal standards and stuff, on this part here I think we need to get Department of Justice and others because it is a complex area and you're asking a specific question. I don't want to shirk that but I want to make sure I get it exactly right. And so I do think part of what we should do is perhaps at the closed hearing tomorrow walk through that with the intent of taking what you've asked and seeing if we can get it declassified and out to the American people so they can see how exactly how we do it because I do think that should be answered. Sen. Merkley: In between these two pieces, the FISA court gives an interpretation of the plain language of the law, their interpretation is what translates the standards of the law into what is governable in terms of what you can do. I had an amendment last December that said these findings of law that translate the requirements that are in the law into what is permissible needs to be declassified so we can have the debate. I believe that what you just said is that you want to have that information to be declassified that explains how you get from these standards of law to the conduct that has now been presented publicly. Did I catch that right and do you support the standards of law, the interpretations of the FISA court of the plain language to be set before the American people so we can have this debate? General Alexander: I think that makes sense. I'm not the only decision maker in the administration on this process so there are two issues I'm not equivocating. I just want to make sure that I put this expectation exactly right and that is I don't want to jeopardize the security of Americans by making a mistake and saying yes we're going to do all that, but the intent is to get the transparency there. So Senator I will work hard to do that, and if I can't do that I will come back to you and tell you why and we will have that discussion and run it out and I defer to the chair of the intelligence committee. But I think that's reasonable to get this out. Having said that I don't have the legal background that perhaps you have in this area. Sen. Merkley: General I thank you for your statement of support. I also want to thank chair Feinstein who helped develop and send a letter expressing this concern about the secrecy of the interpretations of the FISA court ... I think it's time that [the FISA interpretations] become understandable and public because otherwise how in a democracy do you have a debate if you don't know what the plain language [of the law] means. I do have concerns about that translation and I will continue this conversation. It has been two days now since the Guardian and the Washington Post reported that the US National Security Agency has "obtained direct access to the systems of Google, Facebook, Apple and other US internet giants, according to a top secret document." As part of a surveillance program called Prism, the NSA and the FBI, the Post reported, are "extracting audio and video chats, photographs, e-mails, documents, and connection logs that enable analysts to track foreign targets." But since the initial reports, the Internet companies have all denied this "direct access" claim , which prompted the Guardian on Saturday to publish the secret source document showing the NSA's description of Prism as program enabling "collection directly from the servers of these service providers: Microsoft, Yahoo, Google, Facebook, Paltalk, AOL, Skype, YouTube, Apple." So what exactly is Prism and how does it work? [I]nstead of adding a back door to their servers, the companies were essentially asked to erect a locked mailbox and give the government the key, people briefed on the negotiations said. Facebook, for instance, built such a system for requesting and sharing the information, they said. [...] In at least two cases, at Google and Facebook, one of the plans discussed [with the government] was to build separate, secure portals, like a digital version of the secure physical rooms that have long existed for classified information, in some instances on company servers. Through these online rooms, the government would request data, companies would deposit it and the government would retrieve it, people briefed on the discussions said. This could still be understood as "collection directly from the servers," but the distinction is that it is not "open-ended access." Under this system, the NSA — or the FBI on behalf of the NSA — would obtain a court order under the Foreign Intelligence Surveillance Act and use it to demand the respective company turn over various data into its "separate, secure portal." The scale of the data grab, though somewhat limited in scope by the court order, could still be huge. As was separately disclosed earlier this week, for instance, a single FISA order can be used to obtain millions of phone records. So this means that if the companies are not providing "direct access" to their servers to mine data indiscriminately, then the "separate, secure portal" can also be used not just to "deposit" data, but also to obtain access to real-time communication flows, presumably authorized by a FISA order and implemented by the respective company that receives it (Google, Apple, Facebook, etc). Indeed, in a statement Sunday, the US director of national intelligence James Clapper said in a statement that Prism was authorized under Section 702 of FISA and he described the program as an "internal government computer system used to facilitate the government's statutorily authorized collection of foreign intelligence information from electronic communication service providers." The question, then, is how sweeping the FISA orders are. The Post reported that "from inside a company’s data stream the NSA is capable of pulling out anything it likes" and also said that the NSA's spies use Prism through a "Web portal" that entails entering “'selectors,' or search terms, that are designed to produce at least 51 percent confidence in a target’s 'foreignness'." This suggests to me that we are talking about dragnet FISA orders that oblige the companies to turn over huge amounts of data, some in real time, handled by the NSA on a system codenamed Prism, which may involve the NSA having its own "secure portal" within or at least linked to company servers. I should note that all of the above is my own speculation based on an analysis of the available facts. Other theories I have heard proposed include that the NSA has essentially secretly "hacked" the respective companies' servers by spoofing encryption certificates. But I think that is far-fetched and that what I have suggested here is likely more in line with what is happening, though, again, I am only speculating. Without access to the full leaked source documents, it is difficult to comprehensively analyse the details. Only a fraction of the secret documents has been published so far, presumably for legal and/or editorial reasons. There are reportedly 41 top-secret leaked PowerPoint slides in total related to Prism but only about four or five have been made available by the Guardian and the Post. It is my hope that they will all surface eventually so we can get a better and more accurate understanding of what this controversial surveillance program entails. Facebook said it does not "provide any government organization with direct access to Facebook servers." Apple said "we do not provide any government agency with direct access to our servers." Microsoft said "If the government has a broader voluntary national security program to gather customer data we don’t participate in it.” Yahoo said "We do not provide the government with direct access to our servers, systems, or network.” Paltalk said it "does not provide any government agency with direct access to its servers.” AOL said that it does not "provide any government agency with access to our servers.” And Google, too, said that it had "not joined any program that would give the U.S. government — or any other government — direct access to our servers." PRISM allows “collection managers [to send] content tasking instructions directly to equipment installed at company-controlled locations,” rather than directly to company servers. The companies cannot see the queries that are sent from the NSA to the systems installed on their premises, according to sources familiar with the PRISM process. This seems in line with my theory above about the functionality of the system — that it is a "secure portal" within or at least linked to the companies' servers. What is particularly notable is the role of the FBI in reviewing the search terms, and the fact that the companies apparently do not see what the NSA is searching for. I think this hammers home the point regarding the sweeping scope of the FISA orders, which we need to know much more about. Even without any further information, however, it is clear to me that Prism has huge ramifications — in particular for all non-US citizens using services like Gmail, Skype, and Hotmail. In recent weeks, there have been a series of controversies in the United States over the Justice Department snooping on journalists as part of aggressive investigations into leaks of classified information. The most egregious case involves Fox News reporter James Rosen, whose private emails were secretly obtained, his phone records grabbed, and his movements to and from a government building electronically tracked. Rosen sparked a leak investigation after he authored a story in 2009, based on US intelligence passed to him by an anonymous source, concerning possible nuclear tests in North Korea in response to United Nations sanctions. The case has attracted widespread coverage, and the extent of the monitoring of Rosen — and the FBI's accusation that he was "an aider, abettor and/or co-conspirator” who committed a crime for merely reporting news — has outraged media organisations. Some high-profile figures, including the lawyer James Goodale, have called for attorney general Eric Holder to resign for authorizing the surveillance. But one element of the Rosen case has been largely overlooked: that is, the role of Google in handing over Rosen's emails. That is a point made by WikiLeaks founder Julian Assange in an opinion piece for the New York Times published Sunday. "There has been little analysis of Google’s role in complying with the Rosen subpoena," Assange noted. I have been looking into this very issue in the past week, and so it seems like a good time to lay out what I've learned. An "exact duplicate" of all communications between Rosen's Gmail account and three named email accounts deemed of investigative interest, two of which were @yahoo.com and one @gmail.com. Specifically: all emails sent or received by Rosen to and from any of the three accounts, whether marked "cc," "bcc," "fwd," or "sent"; any deleted messages; messages maintained in the trash folder or other folders (i.e. drafts); and copies of attachments sent between Rosen and the three named accounts including videos, documents, and photographs. ALL communications sent to and from Rosen's Gmail account on 10-11 June 2009, from or to ANY address (i.e. not just the three named accounts). Specifically, as above, the FBI sought: messages marked "cc," "bcc," "fwd," or "sent"; any deleted messages; messages maintained in the trash folder or other folders (i.e. drafts); and attachments including videos, documents, and photographs. Screen names associated with Rosen's accounts, account numbers, status of accounts, dates of service, methods of any payment, telephone numbers, addresses, detailed billing records, histories and profiles. Log files from Rosen's account showing dates, times, methods of connecting, ports, dial-ups, IP addresses, and/or location from which he connected. Google was told that it must keep the warrant secret and should not "notify any other person... of the existence of the warrant." The question is: could Google have challenged the lawfulness of this contentious warrant and fought in the courts in an attempt to notify the journalist? I asked Google, but the company said its policy was not to comment on specific cases. What I was able to establish, however, is that when Google receives an order to turn over user data as part of a search warrant, in most cases it does not see the full affidavit from the FBI investigator that details the specifics of the case — and the FBI has no legal obligation to inform Google of the specifics because a judge has already reviewed and signed off on it. But crucially, what Google does sometimes see, a well-placed source told me on condition of anonymity, is an "attachment" that occasionally accompanies a warrant ordering it to disclose certain information. The attachment is an important document because it details the specific types of data investigators expect Google (or any other given company) to turn over. It also sometimes contains a note for the authorities detailing what they should look for in the data once it is disclosed. In the Rosen case, there was a six-page attachment that detailed all of this. You can read it here. It breaks down the data Google was ordered to turn over, and it also has instructions for the investigators. If Google received this document before turning over Rosen's emails, in my view the company could fairly easily have established that this was a warrant to obtain private data on a journalist and his source. How? The Rosen attachment, though it does not explicitly name Rosen or Fox News, outlines that the FBI is looking to find evidence concerning violations of the Espionage Act (18 USC § 793), a law that has been used at least seven times by the Obama administration to prosecute people for disclosing classified information. The attachment explains that the FBI is seeking to obtain communications between a man named Stephen Kim (the alleged source of the Fox News story) and the "author of [an] article that is the subject matter of the FBI investigation that is the basis for this warrant." The attachment also refers to "classified and/or intelligence information" and mentions that the FBI is seeking to find evidence in the emails that Stephen Kim and/or "the author" had knowledge of government rules or procedures regarding communicating with "members of the media." It adds that it is seeking to find evidence of the "author's communication with any other source or potential source of the information disclosed in the article," making it clear that it is a journalist's email being targeted. Google would not tell me whether or not it had seen this attachment, again saying that its policy is not to "discuss the specifics of any particular case." But if the company did see it and did not seek to level any legal challenge, there is a legitimate and serious question to be asked concerning the extent of its complicity in the government's surveillance of a journalist in order to expose a confidential source. Hanni Fakhoury, a staff attorney at the Electronic Frontier Foundation, told me that while it is unusual and difficult for a company to challenge a search warrant because a judge has already reviewed and signed off on it, it is still possible to challenge. "Theoretically a challenge to the search warrant would go back to the judge who signed it, who I imagine would be reluctant to change their mind (though you never know)," Fakhoury said in an email. This also raises questions for me about how closely Google scrutinizes individual warrants and court orders before turning over users' private data. Google has a fairly solid track record of standing up to government snooping that it deems disproportionate, and it has commendably pioneered the publication of transparency reports showing government requests to censor Internet content and obtain users' data. But if it turns out Google's legal team were sent the attachment in the Rosen case and did not even attempt to challenge the lawfulness of the warrant, as seems possible, the company's reputation for standing up for users' rights will take a hit — and deservedly so — not least because the spying on Rosen stands out as such a flagrant example of government overreach and excessive surveillance. Below is the full bizarre correspondence between myself and two companies, Cognitec and Total Recall Corporation, which was the subject of a recent article I wrote for Slate magazine called "Lady Liberty's Watching You." As you will see, it started out with me following up a tip about new face recognition technology being piloted at the Statue of Liberty, and ended with me getting sent legal threats warning me not to write about it. A number of outlets followed up the story, including BoingBoing, the Village Voice, and Techdirt. The correspondence — which consists of both phone interviews and emails listed in chronological order — has not been edited apart from a couple of typo fixes and the removal of email introductions and signatures ("hi there," "best regards," etc.) to avoid unnecessary repetition. I am publishing the correspondence in full not only because doing so is in the interest of transparency, but because I feel that it can serve as an educational example — helping inform about the sort of crass, outrageous intimidation attempts journalists occasionally face when attempting to go about their work. Receiving crude threats is unfortunately sometimes part of the job, but never should we back down. I ask for more information about pilot of Cognitec face recognition at Statue of Liberty. Oberg says: "We were doing this through an integrator [Total Recall Corporation]. So what usually happens is our software, we give it to a company that actually integrates it into a real-world application. I am not really the best person to tell you about what's happening with this project, because that's really more [for] the company that is doing the actual project. I mean, yes, they are going to try out our technology there. But as to the status, and how it's going, I am not the best person to answer those questions for you." She adds: "I knew this project was going on but hadn't really checked up on it." She describes what the technology can be used for: "facial analysis to determine how many people have gone through the checkpoints, how many are male, how many are female... we do have ethnicity detection as well but obviously not that accurate for person of mixed ethnicity. But you can also use it for people flow if you see a certain entrance or certain choke point there are too many people gathering you can open another entrance put more staff on etc. It can give a rough estimate of age... age ranges within five years of actual birth date, it is quite accurate. She says the demographics capability was relevant to the Statue of Liberty pilot: "I'm certain that they are interested in that part." I spoke to you on the phone a moment ago. I am a journalist with Slate.com. I'm doing a story on facial recognition technology in New York and was hoping you could give me an update on the status of a pilot I understand Total Recall is running at the Statue of Liberty with software made by a company called Cognitec. Is the pilot still going ahead once the Statue of Liberty reopens? How long is the pilot expected to last? If you could send me some information on this asap it'd be greatly appreciated. Hi Viktoriya, just wondering if you have managed to get me answers to my questions? Millius asks where I heard about the pilot. I explain that I received a tip, had read about it in a police magazine, and that I had also spoken with Cognitec about it. He says: "At this time there is not going to be a pilot project of the facial recognition at the Statue of Liberty although if it was it would be with Cognitec. We do work with Cognitec but right now because of what happened with [Hurricane] Sandy it put a lot of different pilots that we are doing on hold. "There are no plans put something in right now. There are a lot of other things that need to get fixed. And they said that once we get all that stuff up we can start talking about that again. But nothing to talk about right now. "Total recall is doing a security program at the Statue of Liberty. However, if you'd like to do a story about it I could talk to you about it more in detail when we want to do a full press release and so on and so forth. "It's still months away and the facial recognition right now is not going to be part of this phase. "We're in the middle of trying to work out what's going to get installed and what's not going to get installed. "The timing is just premature." Millius now says that the company had "discussed the possibility of it [a face recognition pilot] and it's been completely vetoed." I ask, vetoed by who? He says the "Park Police." I ask why it was vetoed and he says I should contact the Park Police. He declines to answer specific further questions and adds that I am "not authorized" to write about any use of face recognition at the statue. I have a couple more questions for you regarding the Statue of Liberty project. Do you think you could put me in touch with the person at Cognetic who knows most about this contract? Thanks. Please consider this a written confirmation that you are to refrain from publishing any information about the use of face recognition at the Statue of Liberty. As you learned from Total Recall, the project was cancelled and you have false information. If you decide to publish the information, we will need to take legal action to demand an official correction statement. We appreciate your professionalism and integrity. This is quite confusing. You told me yesterday that they were going to be trying out the Cognitec software at the statue. When and why was the project cancelled? I asked you that I did not have any current information and that you need to talk to Total Recall about the status of this project. They told you and confirmed to me that the project is not happening. The City of New York has not approved it. So the software is not going to be used because the City of New York has not given it approval? You said yesterday, and I quote: "Yes, they are going to try out our technology there." Again, I do not have any exact information about this. I thought you spoke to Total Recall about it? I have spoken with Total Recall, yes, but I am trying to verify what they are saying. It is all very confusing and I have been provided contradictory information from different sources. There seems enough confusion to leave the subject out of your article. Quite the contrary, the confusion and people threatening me with legal action only encourages me to keep digging and establish the facts. A follow-up question for you. I have been back in touch with Cognitec and they are now saying that the facial recognition pilot project at the Statue of Liberty was "cancelled" because "the City of New York has not approved it." Please consider this a written confirmation that you are to refrain from publishing any information about Total Recall and the Statue of Liberty or the use of face recognition at the Statue of Liberty. As you learned from Total Recall, the project was cancelled and you have false information. Thanks for the interesting note, Peter. Who was the project cancelled by? You mentioned in our phone call that it had been "vetoed" by the Park Police, and Cognitec told me that "the City of New York has not approved it." Which of these statements is correct? If you could help clarify it'd be much appreciated. CC: Attorney from Greenberg Traurig law firm. I am merely asking questions, Peter, legitimate questions. That is my job. I am a journalist. But If you have no further comment then I shall send no more inquiries. Thanks for your time. RG: I'm just trying to establish some of the details around why the project was cancelled, as you're saying. Oberg: "I have no idea, Ryan, I really don't know. All I know is it's cancelled and that's the end of it... I have no information on it." You did say the other day that they were 'going to try out our technology there.' So I'm just trying to establish what changed and why. "Yes, not on that particular project, though, that particular project I don't know anything about. They informed us it was cancelled and I don't know any more than that." You said you were aware it was going ahead at the statue. "No, I did not say that. I don't know if it was scheduled." Why did you tell me then, 'yes they're going to try out our technology there'? "I don't think I said that." "Then I must have made a mistake. I don't know anything about this project." So you've never had any knowledge of this being tested at the Statue of Liberty, is that true? "No, I don't. As I said, you need to ask the contractor." I'm hoping you might have had a chance to reflect since our correspondence last week. I thought I would give you a final opportunity to talk with me — on record or off — about the reasons for the cancellation of the face recognition project at the Statue of Liberty. I am going to be writing about it based on information from a variety of sources. As things stand, your attempt to prevent me from reporting on the project will be a central focus of the story. But, of course, it doesn't have to be that way, and if you would like to discuss the project and the reasons for its cancellation then I would be happy to make time at your convenience for a phone call. Millius never responded to my final attempt to clarify details around the claimed cancellation of the Statue of Liberty face recognition project. The full article based on the above correspondence can be found at Slate. There was a very interesting interview aired this evening on Channel 4 News with former UK foreign secretary Jack Straw, which touched on the British government's role in the Iraq War and alleged complicity in kidnappings and torture. In 2004, a Libyan Islamist militant anti-Gaddafi fighter Abdel Hakim Belhadj and his pregnant wife were abducted at a Bangkok airport and "rendered" to Libya by American agents. Belhadj was taken to one of Gaddafi's prisons and says he was subjected to torture. At the time, British government officials were publicly denying any role in so-called "extraordinary rendition" — the practice used frequently by the United States under the George W. Bush administration involving kidnapping terror suspects and taking them to secret locations in third countries where they were sometimes brutally interrogated. But amid the revolution in Libya in 2011, a trove of classifed documents were found during the raid of a government office revealing British spy agency MI6 had in fact played a role in rendition — providing crucial intelligence that resulted in Belhadj being handed over to Gaddafi. MI6 did not deny involvement when the documents were discovered: instead, UK government sources insisted the agency's actions were part of "ministerially authorised government policy." Then, in April last year, the Sunday Times reported that Jack Straw — foreign secretary between 2001 and 2006 — had been forced by MI6 to admit he had signed off on the secret rendition of Belhadj. A few days after the Sunday Times report, Belhadj, who is now a military commander in the new Libya, launched legal action against Straw for alleged complicity in illegal rendition and torture. Thomson: It seems extraordinary to have to ask this question... but is the kidnapping and torturing of people by nation states wrong? Straw: Of course it's wrong and we had no part in that. Thomson: Are you sure we had no part in it? Straw: Absolutely. It is wrong. It is absolutely wrong for any of that to have happened. Thomson: And you are sure that the UK government had no part in it, that's what you just said? Straw: Well, I'm absolutely sure that I had no part in this, let's just be clear about this OK, and there is going to be a full-scale judicial-led inquiry on the wider issues. JACK STRAW, the former Labour foreign secretary, admitted that he had approved the secret rendition of a terrorist suspect to Libya after MI6 showed him evidence proving he had signed off the operation, well placed sources say. Straw, who faces questioning by police over claims by Abdel Hakim Belhadj that he was tortured in a Libyan prison after being seized in 2004, was confronted by Secret Intelligence Service (MI6) officers after publicly appearing to deny he had authorised rendition. Asked about Britain’s rendition policy during an interview on BBC Radio 4 last autumn, Straw said: “The position of successive foreign secretaries, including me, is that we were opposed to unlawful rendition, opposed to torture or similar methods and not only did we not agree with it, we were not complicit in it, nor did we turn a blind eye to it." According to well-placed sources, within days of those comments MI6 officers met Straw. “They reminded him [Straw] that he had signed off on it. He was shown evidence and [then] he did accept that he had signed off on the rendition," said one insider. Straw has repeatedly declined to comment publicly on the Belhadj case. This weekend a spokesman for him said: “I think that you will readily understand that while an investigation is pending, it is not appropriate for Mr Straw to respond to queries like yours." 6-8 March 2004: Abdel Hakim Belhadj and his wife Fatima Bouchar are abducted at a Bangkok airport and flown to one of Gaddafi's prisons in Libya. 13 December 2005: Jack Straw, then foreign secretary, tells MPs in response to concerns about rendition: "Unless we all start to believe in conspiracy theories and that the officials are lying, that I am lying, that behind this there is some kind of secret state which is in league with some dark forces in the United States, and also let me say, we believe that Secretary Rice is lying, there simply is no truth in the claims that the United Kingdom has been involved in rendition full stop, because we have not been." 4 September 2011: Documents are found by Human Rights Watch inside the abandoned office Gaddafi's former intelligence chief, Moussa Koussa. One file contained hundreds of secret letters and faxes that UK spy agency MI6 and US spy agency the CIA had sent to Koussa, some revealing "evidence that British intelligence agencies mounted their own 'rendition' operation in collaboration with Muammar Gaddafi's security services." One document showed MI6 counter-terror chief Mark Allen boasting to Koussa about helping render Belhadj in 2004. “The intelligence was British," Allen wrote, adding that assisting in rendering Belhaj by providing information about his movements was “the least we could do for you and for Libya." 5 September 2011: Straw tells BBC Radio 4 in response to the discovery of the documents: “The position of successive foreign secretaries, including me, is that we were opposed to unlawful rendition, opposed to torture or similar methods and not only did we not agree with it, we were not complicit in it, nor did we turn a blind eye to it." 8 April 2012: Extensive details on the rendition of Belhadj and his wife emerge in a special report published by the Guardian. It opens: "Just when Fatima Bouchar thought it couldn't get any worse, the Americans forced her to lie on a stretcher and began wrapping tape around her feet. They moved upwards, she says, along her legs, winding the tape around and around, binding her to the stretcher. They taped her stomach, her arms and then her chest. She was bound tight, unable to move." 15 April 2012: The Sunday Times reports that following Straw's Radio 4 appearance in September 2011, officers from MI6 met with him. A source told the newspaper: "They reminded him [Straw] that he had signed off on it [the rendition of Belhadj]. He was shown evidence and [then] he did accept that he had signed off on the rendition." 18 April 2012: Belhadj launches legal action against Straw over alleged complicity in illegal rendition and torture. 14 March 2013: Straw claims in an interview aired by Channel 4 News that he is "absolutely sure that I had no part in this [extraordinary rendition and torture]." It doesn't take a genius to see that something does not add up here. There are clear inconsistencies between statements made publicly by Straw and the secret documents, and Straw's Channel 4 interview today contradicted both the secret documents and the claims published by the Sunday Times. The long-delayed judge-led inquiry into the UK's involvement in rendition cannot begin soon enough. UPDATE, 4 April 2013: It is reported that Straw and former MI6 spy chief Mark Allen say "they cannot respond to allegations of conspiracy in the torture of a prominent Libyan dissident [Hakim Belhadj], pleading the need to protect official secrets." Court documents seen by the Guardian show the former foreign secretary is arguing that the law means he "can neither confirm or deny [MI6] operations," claiming he cannot plead in the case without "causing real harm to the public interest." it was 'readily apparent' ... that the committee at the time was discussing 'extraordinary rendition' — that is, rendition specifically carried out for the purposes of torture. This denial strikes me as tenuous in the extreme, because when you read Straw's full 2005 statement to the parliamentary committee it is not at all clear that when he is talking about rendition he is only talking about rendition in the context of torture. Indeed, he even says at one point that "rendition is a term of art which covers a variety of activities," before going on to add: "there simply is no truth in the claims that the United Kingdom has been involved in rendition full stop, because we have not been." Of course, we now know that the UK was involved in rendition, at the time when Straw was the foreign secretary and thus the responsible minister. as Foreign Secretary, I acted at all times in a manner that was fully consistent with my legal duties and with national and international law, and that I was never in any way complicit in the unlawful rendition or detention of individuals by the United States or any other state. The following day, on 20 December, the UK High Court rejects Abdel Hakim Belhadj's rendition and torture case against the government, which Straw was reported to have signed off on. Astonishingly, the judge says that while Belhadj appears to have a "potentially well-founded claim that the UK authorities were directly implicated in the extraordinary rendition," the case cannot proceed because pursuing it would "jeopardise national security." Belhadj is now trying to appeal against the decision. UPDATE III, 12 November 2015: Citing ongoing Supreme Court proceedings, The Guardian reports that Straw and former MI6 spy Sir Mark Allen "could avoid prosecution over complicity in the rendition and torture" of Belhadj and his wife by claiming immunity in the case.